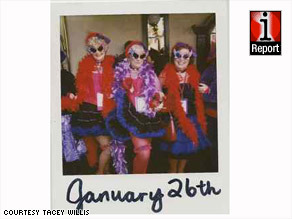 (CNN) -- Every day for a year, Tacey Willis looked for an eye-catching photo subject -- a ballerina, a rocker dude in a bookstore or three older ladies from the Red Hat Society. She allowed herself one shot each day, with only one piece of instant film. Tacey Willis' "Day By Day Polaroid" project contains 365 photos, movies, songs and quotes. But halfway through that year, Willis abruptly took the money she'd saved for a down payment on a car and bought every piece of Polaroid film she could find. Why? Because the Polaroid Corp. announced it would stop making instant film. And without it her project, "Day by Day Polaroid," would never be complete. Sixty years after Polaroid introduced its first instant camera, the company's iconic film is disappearing from stores. From David Hockney's famous Polaroid art compositions, to the line, "Shake it like a Polaroid picture" from OutKast's hit "Hey Ya! ", Polaroid instant film has embedded itself in popular culture. The public's reaction to Polaroid's announcement reflects that. Blogs lament the loss. Polaroid-fan groups have formed on Facebook. On Amazon.com, a four-pack of 10 exposures is selling for $64 -- nearly $1.60 per photo. The announcement hit Willis, an artist in Los Angeles, California, especially hard. She began her "Day by Day Polaroid" project in June 2007 and still had four months to finish. "I really freaked out when they came out with the memo," she said. So why did she choose Polaroid and not some other type of photo? Willis is simply in love with that little white rectangle. "It always turns out completely different than it looks in the viewpoint," she said. "At first I felt frustrated. But then, as an artist, it made it more fun. You had to let it go. I like sitting down with each picture. It's like a baby. You put so much art and soul into it." Willis isn't alone in her devotion. Minneapolis, Minnesota, graphic designer Sean Tubridy founded SavePolaroid.com with some friends he met through a Polaroid Flickr group. The Web site's mission: to persuade another company to produce the instant film. "For me, watching a Polaroid picture develop is like watching a memory form right before your eyes," Tubridy wrote on his Web site. "It's life, and chances are, we'll find it in a box years later and be thankful that we have it -- dirty shorts, nervous smile and all." SavePolaroid.com has about 4,000 members -- 573 of whom uploaded stories on why they think Polaroid instant film is worth keeping. Tubridy agrees that digital photography has its advantages, but he believes that instant film, and its 20th-century technology, still has a purpose. "The biggest misconception is that digital is a perfect replacement for [instant film]," he said. "I don't use Polaroids to replace [digital], to take to parties and events. That's not really practical and I don't think anyone would argue that. It's just something special at times when you want something different." For others, it's more about nostalgia and their Polaroid-snapshot memories, which make it harder to let go of their Instamatic past. Sean Burns, of Columbia City, Oregon, fondly remembers the cross-country trips his family took every summer for more than 20 years. They traveled thousands of miles, covering practically every road west of the Mississippi, and almost every moment is documented on Polaroid film. "Dad thought Polaroid was the greatest invention ever conceived and stubbornly remains loyal to the product to this day," Burns wrote on iReport.com. His father, Otis Burns, received his first Polaroid camera in elementary school in the 1940s. Otis Burns still takes the same camera on his road trips today. At every motel where he spends the night, he takes a photo of the view from the room -- whether it's a pastoral landscape, a brick wall or the parking lot. And on the back of each photo he writes the details of the setting: the room number, the town and the date. "Sometimes magic seems to happen and a deceptively simple picture outside a Motel 6 can say a thousand words," Sean Burns said of his father's collection. "Polaroid photos take [only] a minute to develop, but sometimes art takes decades."